In 2016, the World Trade Organization released an extensive report on small and medium-sized businesses. Its biggest revelation was how little we know about them. SMEs, which employ most workers and account for 95% of all firms, are the lifeblood of the world’s economy. Yet they remain understudied, underappreciated and underserved, little understood even by the larger companies that count them as customers and suppliers. What’s more, they have been consistently ignored by negotiators writing international trade rules. The WTO says SMEs – companies with fewer than 250 employees – have been “largely absent from the broad trade debate.” One result, it says, is that cross-border trade is more difficult and costly for smaller businesses than for larger companies. In some ways, SMEs defy efforts to study them. A “born global” start-up – say, a German firm selling digital wares – has little in common with an African micro-enterprise that lacks internet connectivity and can’t make bank transfers or count on reliable delivery of goods. Available evidence suggests a strong correlation between the technological savvy of small companies and the likelihood they will take part in cross-border trade. eBay data from 22 countries shows that 97% to 100% of “technology-enabled” small firms export but indicates that only 2% to 28% of “traditional” SMEs are exporters. Indeed, technology is the great leveler for SMEs. When it comes to trade, their biggest obstacles are access to distribution networks, information about border regulations and standards, trade finance, trusted payment mechanisms, and reliable, cost-effective shipping. A soon-to-be-published survey of 800 small and medium-sized companies by the digital freight platform ShipA Freight highlights the vital role of technology in the success of these businesses and hints at the rise of the global SME. Some 86% of those surveyed said technology is “levelling the playing field” to allow them to operate globally. They identified high shipping costs, lack of visibility into those costs, and the complexity of international shipping as the main obstacles to selling across borders. Today, public sector and private sector actors are at last trying to solve those problems for SMEs. Governments are scrambling to create online resources with everything from how-to guides to matchmaking services to single-window export-import portals. E-commerce platforms are helping SMEs reach customers at low cost, share product information, establish trust and engage in web-based sales across borders. Digital platforms such as ShipA Freight are giving small businesses a secure, easy way to manage shipments online, walking them through compliance issues, providing payment mechanisms, and offering port-to-port or door-to-door delivery. Taken together, these developments give SMEs a “virtual” scale they could never attain before or achieve on their own. And as both the platforms and the enterprises using them get more sophisticated, SMEs will improve their productivity, lower their costs and gain the ability to plug into global value chains dominated by larger businesses. 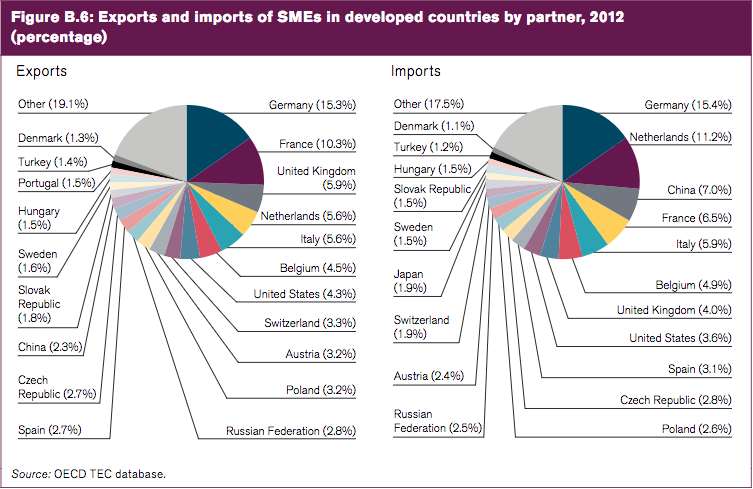 The data on SMEs and trade is incomplete but fairly conclusive. Whether in developed or developing countries, smaller enterprises that do business across borders generally grow, profit, increase productivity, diversify – and survive – at higher rates than those that don’t. Originally published on the World Economic Forum’s Agenda.